Pac-Land as it appears in Smash. Unlock criteria Play all 3 maps in Smash Tour. Pac-Land (パックランド, Pac-Land), also stylized PAC-LAND, is a stage in Super Smash Bros. for Wii U and Super Smash Bros. Ultimate. In Ultimate, Pac-Man is fought here for his unlock battle. Similar to Mushroomy Kingdom from Brawl and 3D Land from the 3DS version, Pac-Land is a side scrolling stage that moves automatically. The scrolling speed is dependent on each player's location: moving ahead will speed it up, while lagging behind will slow it down. The stage follows the layout of the original Pac-Land arcade game, going through three rounds before reaching Fairyland. After this, the stage scrolls back to the left, mimicking Pac-Man's return trip in the original game. After the first two rounds, a "Break Time" sign appears, and a point display is shown; this is purely aesthetic, and no high score is kept. The stage starts at Pac-Man's House, and scrolls through a town where buildings can be used as platforms. Fire Hydrants appear throughout the stage, and shoot water that pushes players back. One hydrant can be pushed away; if done correctly, the player is rewarded by temporarily growing, akin to touching a Super Mushroom. The second section is a forest where players appear as silhouettes behind the trees. Several tree trunks appear as obstacles. The third section is a bridge consisting of platforms suspended above water (which players cannot swim in). A model ship can be collected to add extra platforms, and water spouts serve as damaging hazards. The stage then transitions to Fairyland, where the Mother Fairy appears. She spawns a pair of Wing Shoes that reward a player with a temporary boost to jump height. The stage then begins scrolling right-to-left, signalling the return trip. It starts with tall cacti that serve as obstacles, before moving into a canyon area that features collapsing log bridges. Hitting a certain point spawns a Special Pac item that grants temporary invincibility. After passing by a small lake, the stage returns to the town. Pushing a certain hydrant releases balloons that heal damage when touched. The stage ends at Pac-Man's house, where Ms. Pac-Man can be seen. The cycle then starts over again on a new trip. Every time a cycle starts, a splash screen displays the number of the current trip. Each cycle takes approximately two minutes and thirty seconds to complete. Unlike the original Pac-Land, the cycles are the same each time, although the color of the sky is dependent on the trip (every first trip is afternoon, every second is sunset, every third is night, and every fourth is morning). In Super Smash Bros. for Wii U, the Ω form of this stage takes place in the canyon area. Despite having walls, wall jumps are impossible here; this is the only stage with this distinction. The platform also extends below the blast line. In Super Smash Bros Ultimate, the Ω form and Battlefield form are similar to the Ω form in SSB4; however, the main platform does not extend below the blast line and is resized and reshaped to match Final Destination and Battlefield, respectively. The three soft platforms of the Battlefield form are made of pixelated wood and are unique to this form. The characters are still flat, which also flattens the hitboxes and alters gameplay significantly as a result. Ω form in Super Smash Bros for Wii U. 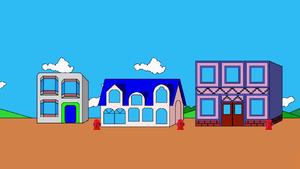 The town level as it originally appeared in Pac-Land. A fire hydrant can also be seen. 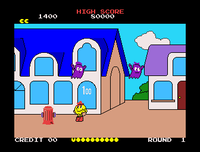 The stage is a faithful recreation of the 1984 arcade game Pac-Land, a side-scroller where Pac-Man sets off to return a lost fairy to her home. Starting at his house, Pac-Man goes left-to-right through three areas before reaching Fairyland. In exchange for returning the fairy, he receives a pair of Wing Shoes, which allow him to jump indefinitely. He then travels right-to-left through a fourth area to head home, after which the cycle repeats. Every area except the Castle is featured in this stage. While the original game's levels change as the game progresses, the Pac-Land stage has a predetermined layout that always remains the same. Pac-Land is notable for being one of the first games to use parallax scrolling (where the foreground and background move at different speeds to simulate perspective), long before it became a gaming mainstay in the 16-bit era. This is reflected by the parallax scrolling on the stage. It is also the first official installment to feature the more anthropomorphic designs of the Pac-Man characters in-game. The version published by Midway Games in the United States featured the character designs from the Hanna-Barbera Pac-Man cartoon. The setting of Pac-Land reappears in later Pac-Man games, but with different designs. Its most notable modern appearance is in Pac-Man World 2. This stage is banned in tournaments, due to the stage containing walk-off blast lines, autoscrolling, no grabbable edges, and sections that require precise platforming, which completely disrupts any form of competitive play. On the bridge section, there is a lone hydrant on a platform. If Mr. Game and Watch faces the right and jumps on that platform, to the left of the hydrant, he will begin to repeatedly perform a landing animation every other frame. If Bellossom is summoned on this stage, its Sleep Powder will move away from Bellossom. Pac-Man's house in Super Smash Bros. for Wii U. The town area of the stage. Pac-Man, Toon Link, Yoshi, and Male Wii Fit Trainer in Fairy Land. Rosalina next to the Fairy Queen. Partial panorama of the stage from Ultimate. If Little Mac hits someone with the KO uppercut, the screen won't zoom in. This page was last edited on April 16, 2019, at 02:09.